Geraldine has been involved in breastfeeding support and education for 30 years in Ireland. She works in private practice as a Lactation Consultant doing home visits. She has a major interest in Adult Education and she runs Training of Trainer (Lactation) courses for healthcare professionals in Ireland. She tutors for a group called Cuidiú, training both breastfeeding counselors and childbirth educators.She has organized Peer to peer education for other groups in Ireland and abroad. 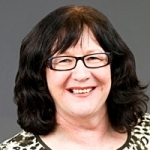 Geraldine has spoken at many conferences both in Ireland and abroad or a range of topics but her choice usually comes back to her interest in Adult education and the theories around learning styles, groupwork, experiential learning and programme development. Birth workers are usually the first contact with parents and are therefore the people who are best placed to influence them in their choice of infant feeding method. Adults only retain information on a ‘need to know’ basis, so meeting the needs of individuals in your interactions is important. Whether you provide a formal breastfeeding class or just have 5 mins to chat during a prenatal visit, what is the best way for you to provide evidence, which information is important. How can you help parents to make an informed decision about feeding. Adult education theory, learning styles, aims and learning outcomes for your interactions, as well as breastfeeding information will be presented and ideas for how you can make your clients learning fun and interactive.